I’ve just had another week (couple of weeks? month?) that ended horribly for me mentally. I ended up nearly incapacitated with hurt, anger, and hopelessness, curled up on my bed in a puddle of tears and surrounded by tissues that I’d flung wherever. And something that has struck me (yet again) is how difficult it is to explain this outcome and all the little triggers, inner and outer, that lead to it. I still am convinced that most people do not have the least idea how to deal with someone in this situation, or clearly on their way to it. This even (maybe especially?) includes family members, who have known me for years and have varying levels of knowledge about the struggles I face periodically, but who still just don’t KNOW what it’s like to be me at those moments or how to be WITH me. I can’t blame them, most of the time, honestly. In their place, I might be unsure what to do or say (and how to handle any lightning bolts that come zinging my way out of the storm) and possibly just find it easier (safer?) to wait until that storm was over, the clouds all blown away, until I came near again. But when it comes down to it, in my own place, I can’t help at those times but feel angry and resentful that few people do know how to approach, how to offer support. And if family members, who are supposed to love me and be there for me, just as I’ve always tried to do the same for them, cannot be there for me, what does that say about them, or even about me? Those moments leave me mostly alone, feeling abandoned. I mentioned on Facebook, to friends, that that medium is a dicey place for trying to reach out for true support. How in the world do we use the one medium that keeps us in touch most readily to really connect, to really help each other, when it generally is limited to use as a place for sharing mundane details of day-to-day life, news of our kids’ accomplishments, and photos that show us in vacation spots or in our best moments? I do appreciate that when I put out that little message, some friends offered their support and care, just saying they were thinking about me. That did mean something. A lot, really. But in real life, how in the world do I get support from those whom I need when I’m giving off a really bad, hopeless, negative, angry, and, yeah, even “crazy,” vibe? Most normal people would run away, far and fast. This is been one of my biggest concerns over the years as I’ve struggled with this beast of mental illness. I’m a pretty “normal” person most of the time, and people say they find me to be upbeat, happy, blessed with a great smile. I care and really put myself out there to help others. I do spend a lot of my time and energies trying to help those around me. But sometimes life just gets to me or I end up spending too much of my energies on others and then run dry in my own well. It’s kind of like I’m boiling water on the stove, and as long as there’s still water in the pot, even if it’s only a half-inch of water, everything’s fine. 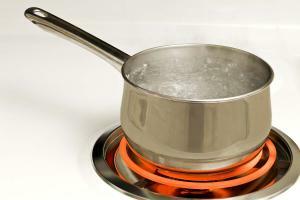 But the second that water boils off, the pan is in big trouble. And despite my best efforts to balance my life (ha!) over the years, it’s still a really tricky act to pull off successfully, and I burn out sometimes. The pan bursts into flames as soon as it gets dry, and I need to be removed from the burner, cooled down, and filled back up again with water. Those are the times I need loving friends and family who, armed with oven mitts, are willing to help me cool off and refill my reserves. I sit on the stove sometimes and whistle like crazy, wondering where my mitted friends are, because it’ll take a lot longer to get myself filled up on my own merits. If left for too long, I stay hot and just get angry. I know it’s hard to come near me at those times. I realize that. But I know I’m worth the effort. I know that I am a good, genuinely caring person who uses my talents and resources to be helpful to others. I’m fun, I’m generally kind, I’m pretty handy to have around in a lot of ways. So I give. Even just in a balance-sheet kind of way, I’m worth the investment. But during all those good moments, I still fear that those I care about aren’t taking the time to find out more about the few really bad, challenging moments that are my reality just as much as they are the good ones. I want my friends and family to want to really get to know me, to understand me a little better, so when the storms come, they’re ready for a little lightning. Because when the sun comes back out again, it will warm them even more radiantly. All in all, this is probably true for every single one of us, whether we have mental illness or not. We need people in our lives who really get to know the whole us so they’re ready for the times we’re not our best selves. But it’s just magnified a lot more with mental illness, and society still places a stigma on it, where many people misunderstand and avoid in their ignorance. I wish we could all do better to stop this from happening. I would be happy to keep all this to myself. I’m not proud of who I am in my dark times. But that’s my reality, one I’m trying to mitigate and improve, bit by bit. So in the interest of increasing awareness and helping others, just by being open and sharing information, here I am, baring my soul. And thanks, from the bottom of my hot saucepan, to those dear friends who have braved the storms and held me until they’ve cleared. The world is brighter in so many ways because of you. Thank you, my dear ones. You are amazing… Thank you for sharing your thoughts and demons… I understand something about mental illness and it is heartwarming to hear of another’s struggles and benefits others to know they are not alone. I hope you know you are loved and cared for and yes… definitely worth it.